I kept seeing all the "winner" posts and thought that I hadn't won a darn thing, but then I got an email from Moira at Literary Tease...I won one of her May Giveaway Day prizes! 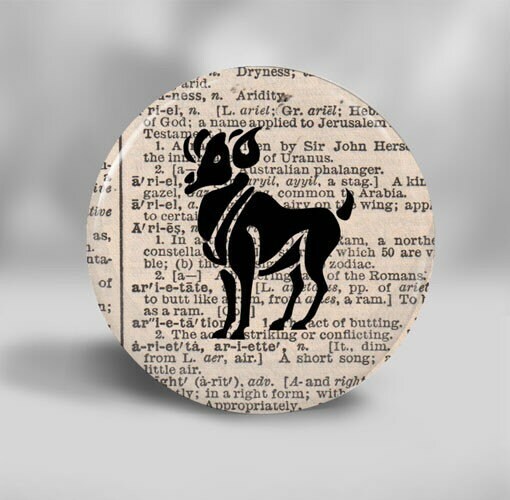 and one of the pocket mirrors from her store...maybe one of these (I hope she sees this!)? and...she says there will be a surprise, too! 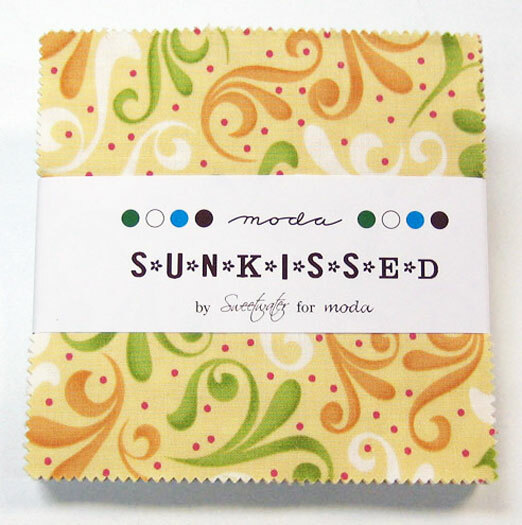 Make sure you check out her blog Crafty Moira @ Literary Tease and her Etsy site Literary Tease to see all the cute stuff she has! WOW! I was so surprised to have not only received 498 (I know...so close to 500) comments, but my blog also has over 120 followers! Once that follower number reaches 150, I think we will need another giveaway! I won't keep you in suspense...here are the winners! 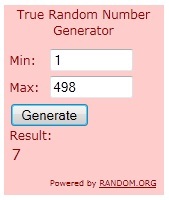 All 5 winners have been emailed. :) If they do not get me an address within 48 hours, I will draw a new winner. So what does that mean? Well, that means that we have a lot to talk about today. First up, I am very excited to say that I am being featured (well, I will be on Friday...I'm posting a bit early. 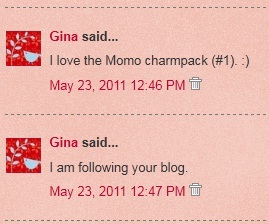 LOL) on Sew Happy Geek! Make sure to check out her site, because she is participating in Sew Mama Sew's May Giveaway Day, too! We coordinate one day when everyone with a shop or blog can give something away. We create a master list, and we leave the lists up for several days so readers can take their time visiting the hundreds of participating blogs and shops. 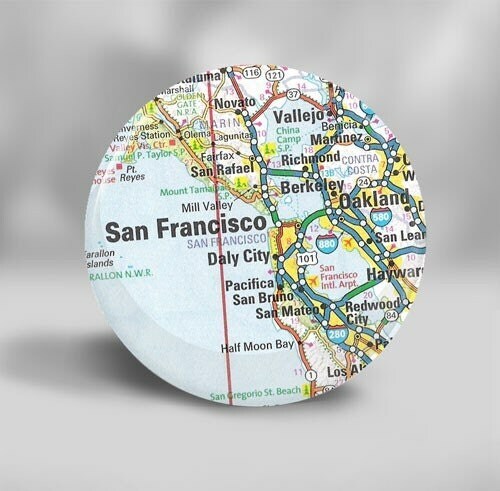 We also provide some structure with categories and international shipping info. Giveaway Days have been a lot of fun for everyone involved! 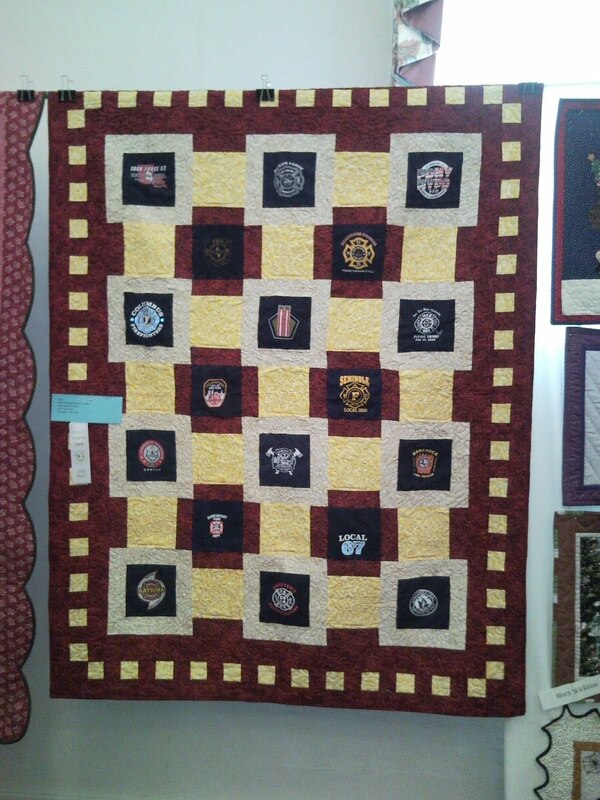 First off, I want to share with you the quilt that I made for my mom for Christmas. It was my first attempt at a bargello quilt and I like the way it turned out. On the left, you can see how I quilted it. I machine quilted it on my Pfaff. I just echo quilted the design that I perceived. On the right, is my "signature". I like to hand stitch that into the back of all of my quilts. :) There are a couple I missed, but they reside at my mom's house, too, so I will get them eventually. Okay, okay. Onto the giveaway. 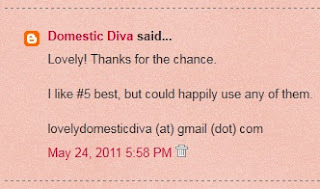 Leave one comment per entry, making sure there’s a way for me to get a hold of you. Tell me which prize is your favorite. If I can't get a hold of you, I will draw a new winner. 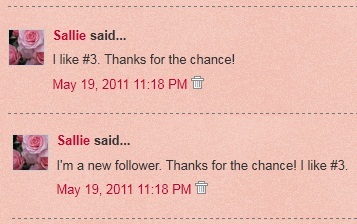 I’ll ship them out on 30 May as long as the winner has responded with her address. It figures...only week number 2 for me and I am already slackin'. 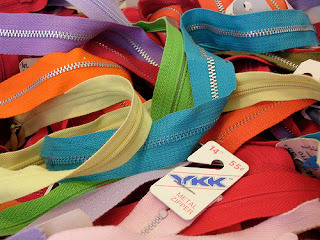 That logo will be the only picture you see on my blog today. 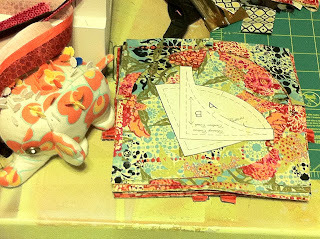 I decided that the Ogee QAL wasn't going to be big enough, so I am now cutting out a second set of pieces for it. I'm going to double it. I have managed to get black frames put on all of the green metallic squares for the Mod Times QAL. I even managed to sew some of the small khaki squares onto them and iron it. Sadly, my sewn together piece has not gotten any bigger yet. That will be this weekend. Make sure to stop by for WIP Wednesday next week because I plan on getting a lot done this weekend (you know, unless something even more fun happens. LOL)! 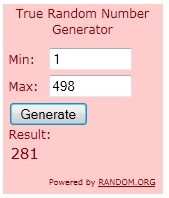 Just a Bit Frayed is having a giveaway! 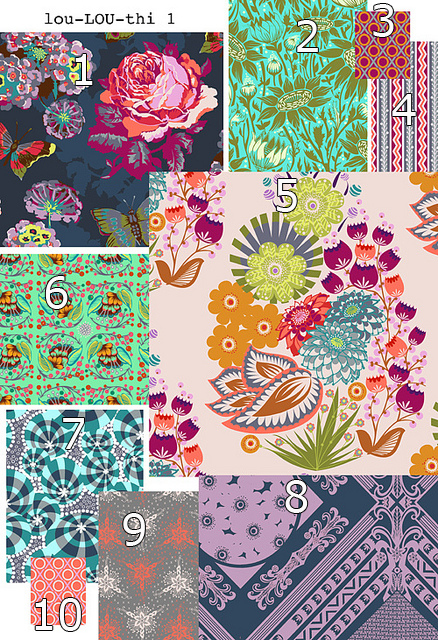 They are giving away some of Anna Maria Horner's Loulouthi line. 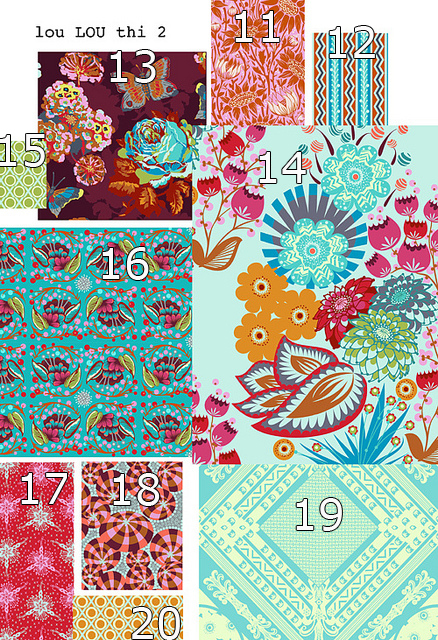 My favorites out of these fabrics are #s 1, 5, 13, 21 and 25. As you can see, I love the big prints! 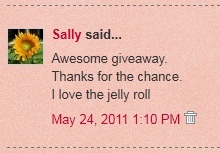 Hop on over to the giveaway to enter for your chance to win! I have completed the top. The back needs to be ripped and re-pieced. Then on to sandwiching and quilting. It will not be done in time. 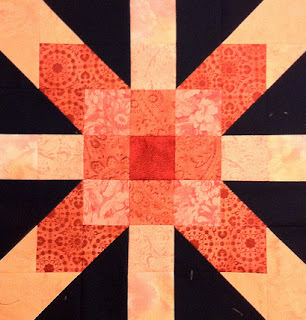 I have started piecing the top. Please forgive the awful picture. My living room just doesn't get enough light. 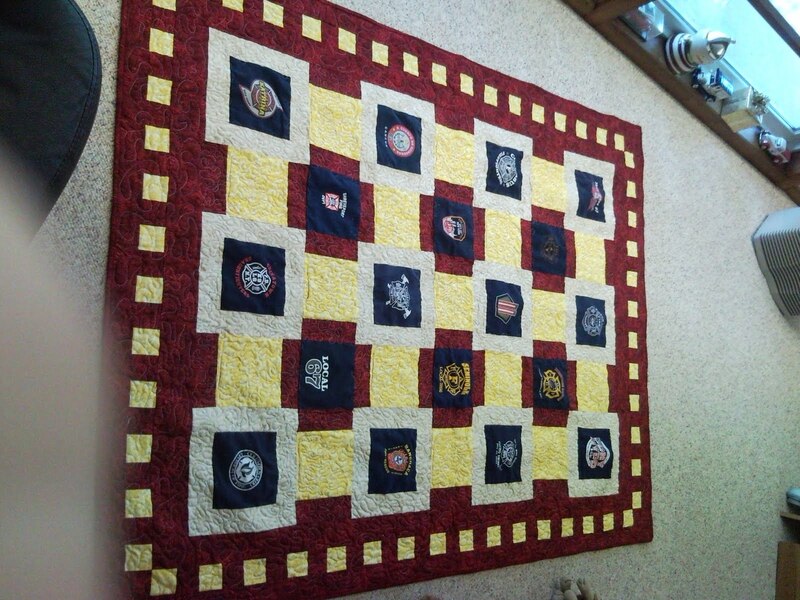 I just learned from my sister that she wants a king sized quilt. I guess some math is in order before I continue. I am actually completely caught up on this one. Woohoo! All of my pieces are cut and stacked; ready to go. And, I just have to say, that my itty bitty rotary cutter is just about the best tool for cutting these curved pieces. It made my life so much easier! I'll update this section after the inventory as well. 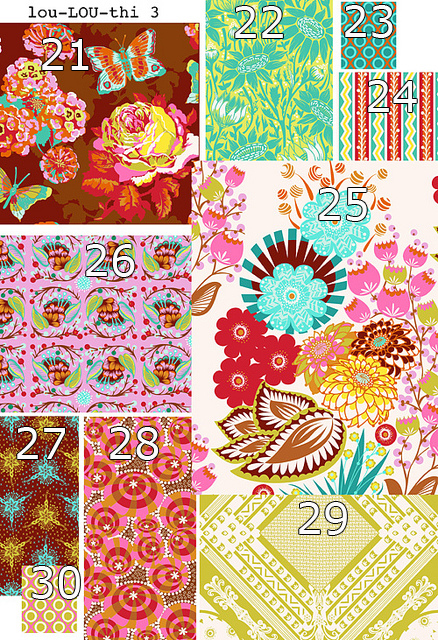 I am linking up to Freshly Pieced for WIP Wednesday with Lee and so should you! 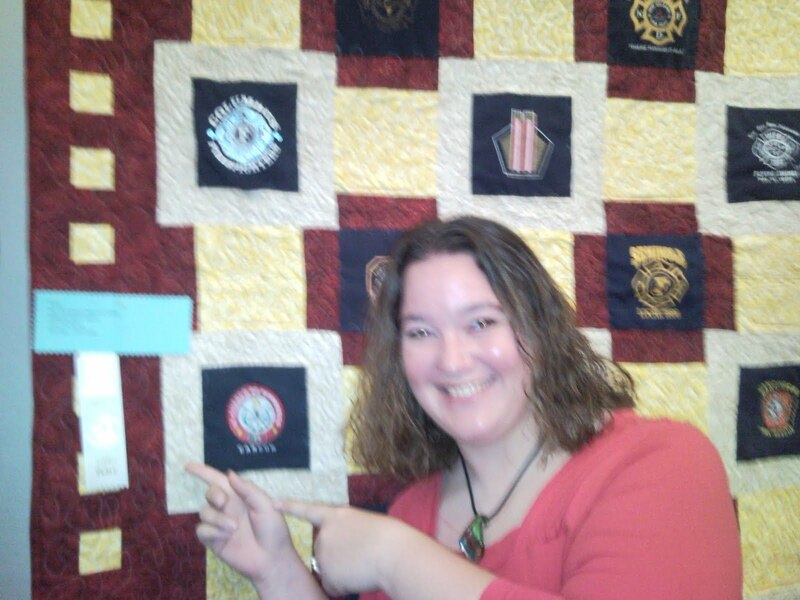 I decided to join in with the Blogger's Quilt Festival. You can read about it on Amy's Creative Side. 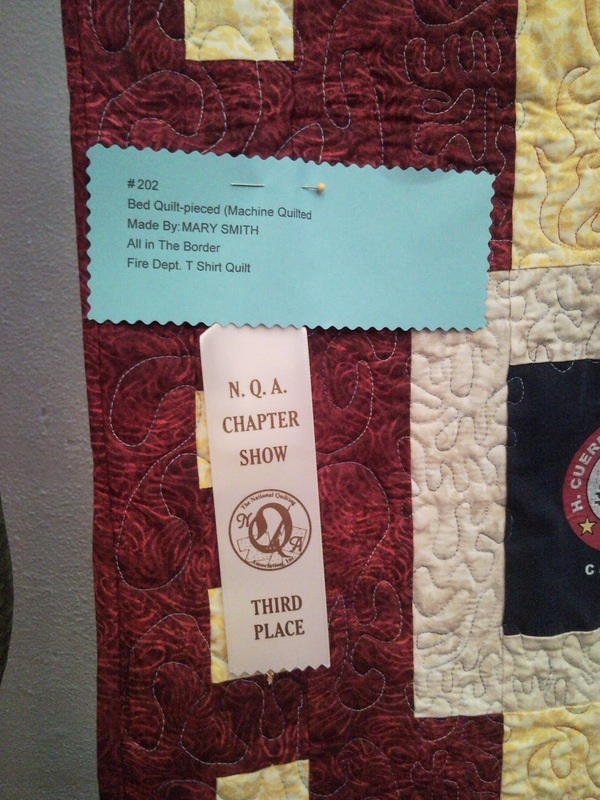 The quilt I decided to share is the first quilt I ever entered in a show (and maybe my 2nd or 3rd quilt ever). It is the T-shirt quilt I made for Mr. Genius. He is a firefighter, so I used some of our fire department shirts to make it. It would just be easier to show you than to try to tell you any more...You can click on the pictures to get more detail. The quilting is done in red and blue thread. There are red flames stitched into the yellow squares and then I squiggled blue everywhere else for water. Mr. Genius informed me that although I "measured" the quilt for size using my self, I am short and he, well, isn't. He has requested another version of the same quilt (meaning fire t-shirts) that is large enough for him and he will give me back the one that is apparently "Mary" sized.